For many years, I was reluctant to visit the former death camp of Auschwitz. I was of course familiar with its historical background. In an isolated area of Eastern Poland, Nazi Germany established a labor camp, which was expanded by the establishment of a death camp the following year. More than a million people were killed there. Among the victims were my aunt Jente Hammersfeld, her husband Jechiel, and their children. I knew I would find a visit to the former death camp difficult to bear. Heiko Maas has often said that it was Auschwitz that inspired him to go into politics, a sentiment with which I felt an immediate affinity. We all have to do our part to ensure that such a crime against humanity will never be repeated. The desire to kill is part of our human inheritance. The Bible tells of Cain’s murder of his brother Abel. “Thou shalt not kill” is one of the most important biblical commandments. And yet, it happens all the time and everywhere. In Greek mythology, Oedipus kills his own father. But the knowledge that murder, manslaughter, violence and war will always be with us must not lead to resignation. Those who seek to prevent it are worthy of our respect. 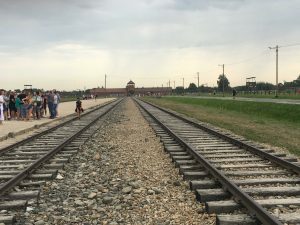 When I received an invitation to accompany Foreign Minister Maas on his visit to Auschwitz in late summer, I accepted it immediately, despite my deep misgivings. I traveled on a German military aircraft decorated with the Iron Cross of the Bundeswehr to Krakow. From there, I continued onward to Auschwitz, traveling on an air-conditioned bus. The journey was an unsettling experience. My thoughts turned to 75 years ago, and my aunt Jente and her family. How long were they forced to remain inside the cattle cars before they arrived at the ramps at Auschwitz, where Joseph Mengele or one of his fellow officers sent them to the gas chambers? What fears were they forced to endure? What forms of humiliation? The parents, the children, and countless other people. In his memoirs, written from prison in 1946 and 1947, the commandant of Auschwitz Rudolf Höss described how two children entered the gas chamber, lost in play, suspecting nothing. Their mother asked Höss: “How can you bring yourself to kill such beautiful children? Have you no heart at all?” But most of the victims, as we know, died without a word and petrified. Visiting Auschwitz was the right choice. The Shoah was unique. But crimes are happening all the time, everywhere. We must not allow ourselves to be paralyzed by horror and succumb to resignation. It is our duty to confront evil wherever we find it.